As software development cycles continue to accelerate with Agile and DevOps practices, continuous testing is experiencing a growth in popularity. The best-practice approach of testing at every stage of the development cycle not only requires that QA and developers write more tests, but also that they are executed more quickly to keep up with the pace of dev. This has led to an influx of cloud-based cross browser testing tools in the market, which can help with scaling your testing coverage without comprising speed or quality. 1) Does your cross browser testing tool offer the coverage you need? With thousands of different browser, operating system and device combinations your customers could be running, you need to ensure that your apps deliver a consistent user experience. Your testing platform should provide you with the coverage you need to test against every environment, and not leave you scrambling to fill in the gaps. 2) Can your cross browser testing tool scale as your team grows? One of the major benefits of cloud-based test execution is that it frees up your teams to focus on developing quality code and tests. A byproduct of this is that your test suite will grow to cover more of your apps’ features - meaning that you need this tool even more! As you begin to accelerate your testing, you need to ensure that your cloud platform can keep up. That means constant uptime and availability, no queuing for access to the browsers and OSs that you need, and the ability to run tests in mass parallelization. 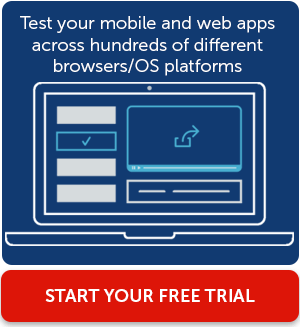 3) Does your cross browser testing tool support mobile web? With over 50% of traffic now coming from your customers’ mobile devices (Digital in 2017: Global Review), it is imperative that you optimize your apps for not just the desktop, but also mobile. Your execution platform needs to account for this diversity, and provide a comprehensive combination of different platforms that your users might be accessing your apps from. 4) Is your cross browser testing tool secure? If security is important for your organization (and it should be), it has to be important for your cloud providers as well. The most secure cloud-based testing platforms give you the ability to test behind your firewall, access to clean, pristine sessions to prevent data from being exposed, and the option to test on a private cloud. 5) Does your cross browser testing tool give your team the feedback needed? Cloud-based testing can be so much more than just access to different browser/OS/device combinations. Along with results, logs and recordings of all of your tests, your platform should also be able to aggregate your data to show trends across tests, teams, platforms and other parameters that help you determine efficiency. This can help you understand where your tests are performing the most efficiently, and help identify areas for improvement. While this list isn’t exhaustive, these are some of the key considerations teams of all sizes need to take into account when comparing alternative testing platform vendors. Understanding these factors will not only help you choose a platform that is the best fit for your team’s needs, but will also pay off in the long run as you are able to scale your continuous testing practices to deliver quality apps to your customers, faster.